Samsung's Series 9 ultraportable 11.6-inch notebook goes on sale this week for a $1149 pre-order price at Amazon and other retailers. Like its larger 13.3-inch sibling ($1600 MSRP), this Series 9 challenges the MacBook Air for ultra-thin supremacy. 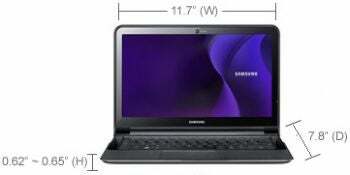 Samsung's new official product page shows this 11.6-inch model sharing the same design features as the 13.3-inch Series 9, with a few key differences. The 11.6-inch model has a Core i3 (rather than i5) processor, 64GB (rather than 128GB) SSD, and, rather disappointingly, maxes out at 2GB of memory. In return, though, the Series 9 11.6-inch model sheds some weight (2.31 pounds vs. 2.88 pounds) and a little more than an inch in width and diameter - making the super slim laptop even more portable. With an $1199.99 MSRP (pre-order and shave $50), the more compact model is also $400 cheaper. Of course, the big question: how does the 11.6-inch Series 9 stack up against the 11-inch MacBook Air? The smaller Series 9 model is even closer in comparison than the 13.3-inch version was, since both 11.6-inch models have a native 1366x768 resolution (the 13.3-inch MacBook Air had a better screen resolution than the 13.3-inch Series 9). The Series 9 11-inch model also maintains its slight advantage over the MacBook Air in thinness: 0.65 inches versus the Air's 0.68 inches. The 11-inch MacBook Air, however, comes in more configurations, with a $999 model offering 64GB of flash storage and an $1199 version offering double that - twice the space offered by the 11-inch Series 9 as well. The MacBook Air also is capable of up to 4GB of memory. Competition is wonderful. If you were interested in the Series 9 before but balked at the premium price tag, this 11.1-inch version is much friendlier on your wallet and even easier to carry to boot.